When a cell phone gets tossed, only a few materials get recycled, mostly useful metals like gold, silver, copper and palladium, which can be used in manufacturing other products. But other materials — especially fiberglass and resins — which make up the bulk of cellphones’ circuit boards, often end up at sites where they can leak dangerous chemicals into our groundwater, soil and air. Consumer demand for the latest electronic devices contributes to the large amount of e-waste, and cell phones are the biggest problem. In 2006, the United Nations estimated annual global e-waste to be about 50 million metric tons. When these products are dumped or incinerated, they release greenhouse gases into the atmosphere — moreover, so does making those products in the first place. Looking initially at cell phone circuit boards, Kumar and his colleagues — including Maria Holuszko, a mining engineering professor and leader of the research team — developed a process to separate fiberglass from resin. This was a task that had proved nearly impossible earlier — and the primary reason the two substances are nearly impossible to recycle. They must be separated to make them reusable. Scientists hope their research will be used to develop a “zero-waste” cell phone. They describe their work in a study published in the journal Waste Management. Previous attempts by other scientists to separate fiberglass from resin used chemicals, heat or physical means, which are “energy consuming,” Kumar said. With those approaches, “the value of the material is low and the process not cost effective,” he said. Their process, on the other hand, uses a technique known as “gravity separation” to cleanly lift organic resins from inorganic fiberglass in a way “that doesn’t harm the environment,” Holuszko said. The process, developed by Ronin8 Technologies, uses sound to achieve the separation. The scientists first calculate the density of the materials and then circulate the materials in recycled water through a sonic chamber — the sonic vibrations essentially “liberate” the materials from each other. The research has become even more important in the aftermath of China’s recent ban on waste imports, they said. 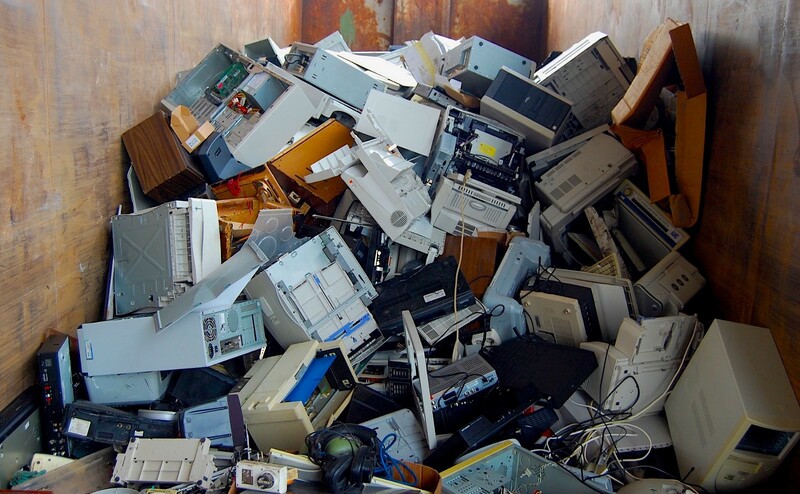 “We need a better way to manage our electronic hardware recycling, and a cost-effective, environmentally responsible method of mining e-waste for valuable materials would be a good step in that direction,” Holuszko said. The researchers are working with the Canada-based Ronin8 facility to develop a large-scale commercial model of the process. The company seeks to promote an environmentally friendly method that will separate different plastics, fibers and metals in electronic waste streams without using toxic chemicals or losing precious metals. The company’s aim is “to address the intrinsic faults in traditional e-waste processes today,” by achieving zero-waste solutions for electronics, said Travis Janke, director of engineering at Ronin8. Kumar said they focused on cell phones because of their higher value and lower lifespan compared to other products. “However, the materials used in this research were circuit boards obtained from cell phones, laptops, desktops, printers and other small household electronic devices,” he said. However, consumers, manufacturers and others must begin working together to find solutions — including those beyond the scope of the research, he said. This means manufacturers must become more responsible for what happens after consumers abandon old products for new ones, and they must develop sustainable reprocessing technology. Also, consumers must become more aware of the impact that comes from throwing out electronics. “Do we really need to change our gadgets that often? We need to be more aware of how to dispose of them safely at the end of their life and develop technologies that can turn them into secondary raw materials for manufacturing new products,” Kumar said. “As scientists and engineers, we need to look for the solution to our new-age addiction to our electronic devices that we love and almost can’t live without. It will not happen overnight, but we need to get on that path, or we will never reach there.